Kingdom Mining, one of the World’s Top 5 GPU based mining firms, had recently launched an advanced autonomous cryptocurrency trading platform, AI Trader. Following its success after achieving record trading gains, the platform is now introducing a new feature in the form of OCO (One Cancels Other) trading mode. The Dubai based Kingdom Mining has a seven MW crypto mining facility which has been fully operational since April 2017. Their flagship trading platform, AI Trader, managed to not only mitigate the losses of buy and hold investors, including the creators of the platform but also generated yields of up to 82% on average monthly returns by trading cryptocurrencies and 120% leverage trading across all strategies. True to the values of transparency, these results are posted on their website and updated in real-time. Users can download and see these results based on every single transaction the AI has made. Following this success just two weeks since its inception, the platform is now launching a game-changing OCO Trading Mode that seeks to give the user more diversity in trading strategies and maximizing gains. This new trading mode gives AI Trader the potential to fundamentally shake up the current paradigm of crypto trading, simplifying it to a degree the world of trading has not experienced before. 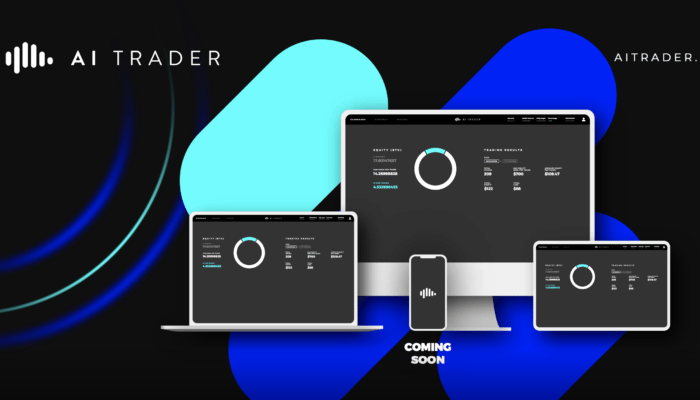 The AI Trader ecosystem is developed on two core principles “Simplicity” and “Transparency” the result is a platform that is disrupting all paradigms of trading. The system is currently live and offers both Currency Trading and Leverage Trading options to its subscribers. AI Trader embraces emerging technologies such as Artificial Intelligence and Machine Learning. This cutting-edge technology is used to review and initiate trading decisions on the market, based on the real-time market information. The uniquely designed ecosystem recognizes market conditions optimal for trading to realize gains from the market. The platform is currently powered by Binance but will soon feature a host of other exchanges. Users can trade in Autonomous AI Trading or OCO trading modes. In AI Trading mode, users activate the desired strategy, and the AI begins trading autonomously seeking optimal trading results. It’s inbuilt dynamic equity management protocols enable the AI to recover any losses by entering trades back with deep learning and with a higher amount, just as a human trader would. Users can see how the AI performed in the last 30 days and can even download a complete transaction history of every single trade. The application features three different AI Trading attitudes built on time-based strategies. Each attitude sets a particular AI behavior in motion. Deep Learning AI technology allows the platform to study the current market patterns using a number of market indicators, to analyze market trends and emerging patterns, and provide real-time buy signal to users. Interpret Real-Time Market Patterns and Executes Swift Trading Decisions. AI Trader becomes the first trading platform of its kind that enables its users to choose to trade with OCO (One Cancels Other). Different from other exchange platforms where the users are given options on either a stop loss or a take profit can be set, AI trader offers a unique opportunity for its users to trade multiple pairs, placing a stop loss and take profit simultaneously. AI Trader is also the first of its kind to offer autonomous trading powered by Bitmex. The exchange offers margin trading with the highest leverage on the market. AI Trader leverages machine learning techniques to effectively and accurately read, analyze, and interpret real-time market patterns and executes swift trading decisions based on its findings. Through in-built deep learning tools, trading decisions are made based on the data the systems have collected while trading in real-time. Users can trade on every single currency provided by Bitmex. For these trades, AI Trader recommends users to set leverage 20x before activating AI Trader to trade on their behalf. A user can trade with as little as 1 USD using this application. The platform has also announced one of the most attractive referral programs in the market. Influencers will receive a 10% lifetime commission for each referred customer they generate. On the other hand, the customer gets a 10% lifetime discount for registering on the platform using the referral link. The platform has three different pricing packages users can choose from. A trading account can be activated by depositing a minimum of $150. At the moment, deposits using Bitcoin Cash, Litecoin and Credit Card/PayPal payments are supported. New subscriptions will be closed on 20th July pending further notice. This is a limited time offer and will expire on 1/07/2018 at 24:00 GMT. Here is an independent review by Bitcoin Trading Challenge, a Cryptocurrency Day-Trader educating other traders within this market.